The Open House Festival team in Belfast, Northern Ireland, will be holding their Open House Winter Weekender of Irish and American Folk Music in two weeks' time, beginning on Thursday 31 January and ending on Sunday 3 February. The programme includes tenor-banjo maestro Enda Scahill and his group We Banjo 3, whose repertoire includes arrangements of American old-time tunes for a tenor-banjo ensemble. Billed as 'a celebration of all that is good and true about American and Irish folk music', the Open House Winter Weekender has a lineup that includes such US artists as the Old Crow Medicine Show, Sara Watkins, and the Old Tire Swingers. Read the full Open House press release here, and get further information and tickets on the Open House website. 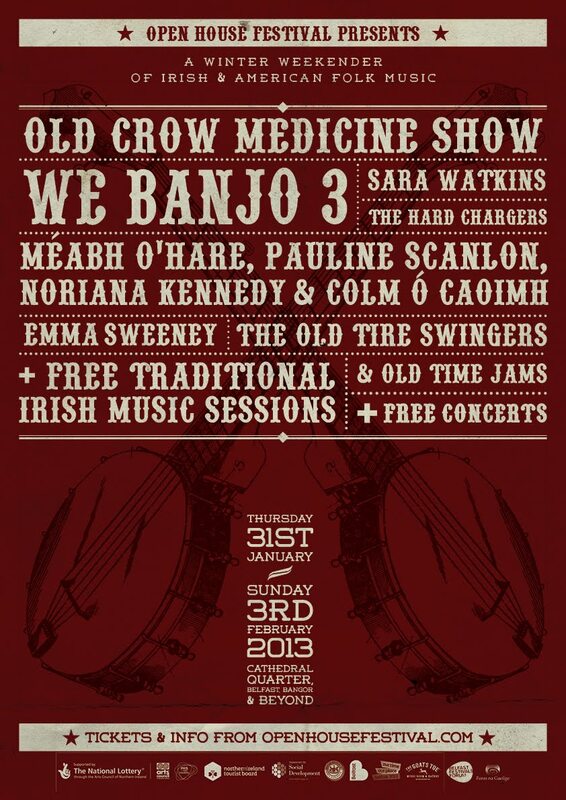 Update 17 Jan.: There are now extra Open House press releases on Sara Watkins and We Banjo 3.